After cashing the WSOP Main Event, 888poker Ambassador Sofia Lovgren is eager to get back to playing more poker. As one of only a handful of 888poker.com ambassadors, Sofia Lövgren is used to being in the poker spotlight. She has enjoyed a great career in cash games and tournaments so far, but like all poker players, it’s the ‘Martin Jacobson Club’ she really wants to join. There’s no spotlight brighter than the one her fellow countryman and 888.com ambassador enjoyed back in 2014 when he won the World Series of Poker Main Event, and this year Lövgren made a deep run before ultimately busting in 322nd of 7,221 runners for $35K. We caught up her post-Vegas to find out more about that experience, the current poker climate in Sweden, and her plans for the future. “I’m happy with my poker, but disappointed with the finish because I had a great stack,” Lövgren says of her Main Event, which saw her chip count peak at 1.6 million when the average 800k. “I was expecting to go much deeper. I feel that I played my A-game for 3.5 days, with no hands that I wish I had played differently. Lövgren’s experience in deep-stacked cash games seems to make these big-field, slow-structure events a perfect match for her. Case in point, last summer she finished 12th out of 7,190 players in the Millionaire Makerfor $75K. Those cash games kept Lövgren busy in Asia for the first few weeks of the WSOP. She arrived for the latter half of the series, and played six events before the Main. While Lövgren and Jacobson can’t play much live poker on their home soil (“The casinos are owned by the state and no commercials are allowed, hence Swedish poker championship is held in Malta,” Lövgren explains), there’s always online poker. And in case you haven’t checked the worldwide rankings recently, the Swedes are crushing. Indeed. Seven of the top 10 tournament players in the world right now are all Swedish! Most of Lövgren’s online grinding takes place on 888.com. And after three years, she still loves being part of the 888.com ambassador team. 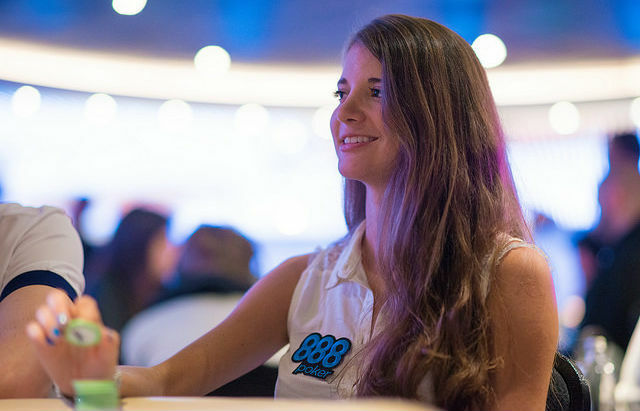 “I’m proud to represent 888poker,” she says. “The site is continually improving and expanding and constantly looking for new opportunities and possibilities to help the growth of poker. It’s a great move by 888poker to sign up as official sponsor for WSOP. After a few days back home in Gothenburg sailing around the Swedish archipelago, Lövgren is now heading back out East, to get back on the grind. You’ll also find her playing the 888.com festival in São Paolo in September, but after that it’s all about China for Sofia. She’ll be playing the WSOP China come December.